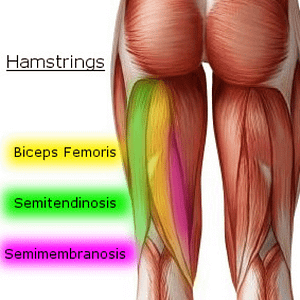 There are three hamstring muscles: semitendinosus, semimembranosus, and biceps femoris. Each originates at the bottom of the pelvis, run down the back of the thigh and across the back of the knee joint, and inserts on the upper leg bone. When the hamstring tendons that cross the knee joint are strained, pain in the back of the knee is felt. Hamstring injuries are typically seen in athletes or active individuals who participate in sports/activities that involve sprinting. When the hamstring muscles are overly stretched or overloaded while extending the leg, they are easily strained. 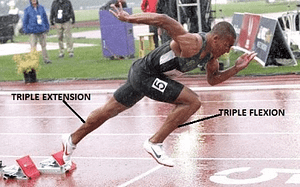 Illustration 2-The hamstrings extend the leg while sprinting. Strains and symptoms vary in severity. Grade 1 strains are the least severe and are easily treated. Grades 2 and 3 strains can produce moderate to severe symptoms and require more treatment than grade 1 strains. Rest, Ice, Compress, and Elevation (RICE). RICE is an easy, effective way to decrease inflammation, swelling, and symptoms. A brace. Immobilizing the knee gives the strained hamstring tendons time to heal. Physical therapy. Stretching exercises increase flexibility and decrease pain, swelling, and inflammation. Strengthening exercises strengthen the muscles and tendons and help prevent future injury. In nearly all cases, hamstring strains will heal following adherence to a treatment program that includes these conservative, non-surgical treatment options. In cases where there is a bone avulsion is associated with a hamstring strain, surgical intervention may be necessary. If you sustained an athletic or physical activity related injury and are experiencing pain near the back of your knee, please don’t hesitate to contact our 3 New Jersey offices to arrange an appointment with one of our Orthopedic Knee Specialists. Once your injury has been diagnosed, a treatment plan will be prescribed. The goal and end result of your treatment plan will be to get you back to doing what you love ASAP. High Mountain Orthopedics specializes in bone, joint and muscle injuries- including knee injuries. Dr. William Matarese Dr. Tony Wanich and Dr. Sherwin Su have over 25 years of combined experienced treating orthopedic and sports injuries. Our practice uses a multi-disciplinary approach that includes physical therapy and activity modification. If surgery is necessary, our team utilizes the latest advancements in Minimally Invasive and Arthroscopic procedures to expedite the healing process. If you are suffering from a bone, joint or muscle injury – contact our offices today! .